Foxglove. Image by Laurie Cambell. Where once there was decking and water-features, fashionable gardening has recently taken a wildlife-friendly turn, and I couldn’t be happier. Emphasis is now on building ponds, log piles and planting native flowers to encourage numbers of bees and other invertebrates. A section of my garden is dedicated to wild flowers, which will hopefully in future years self-seed and run rampant, and is in its first year already teeming with life. Whilst technically foxgloves (Digitalis purpurea) come into bloom in June, they remain in flower until around September, so this July I suggest you make like a bee and appreciate their vibrant colours this summer. The foxglove is one of the easiest native flowers to recognise, with its upright stalk supporting trumpet-shaped flowers, brightly coloured in white, yellow, maroon, pink or purple, with striking round markings on the lower lips. These purple marks act as a “honey guide”, as purple shows up in ultraviolet light which bees are sensitive and receptive to. Look for bees crawling inside the flowers, nearly always starting at the bottom and working their way up. As well as providing pollen for bees, foxgloves are also food for the rare and beautiful Heath Fritillary butterfly. It also feeds a variety of other butterflies and moths, and these in turn provide food for bats. Unsurprisingly the plant has its fair share of folk law attached to it, with its name referring to “folk’s gloves”, suggesting fairies wore the flowers as gloves. This would have been a rather foolish thing to do, however, as the flowers are poisonous. Perhaps the toxic nature of the plant has lead to some of its more sinister nick-names, “Witches’ Gloves” and “Dead Men’s Fingers”. Whilst there are a variety of species of foxglove, digitalis purpurea is the only truly native species, and is capable of reaching 6 feet in height, and can be sown annually in most types of soil. A further benefit of the native species is its remarkable hardiness, and resistance to pests. 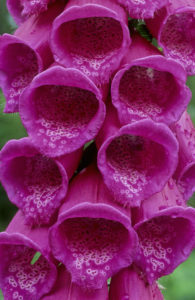 For information on growing foxgloves, check the BBC’s site.